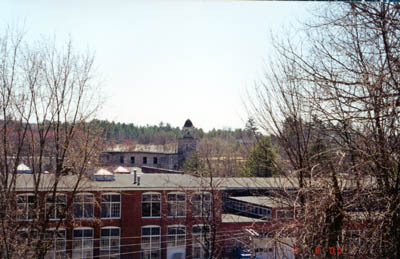 Crown and Eagle Mill in North Uxbridge, MA. Part of the Blackstone Valley NHC. 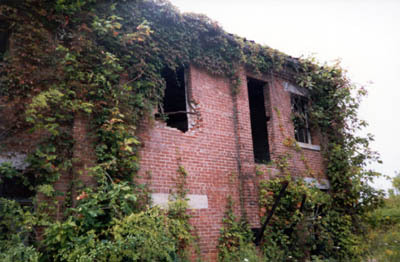 Ann and Hope's old mill in Lonsdale, RI. 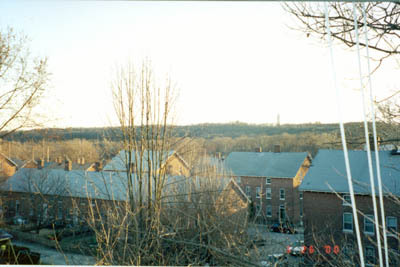 Part of the Blackstone Valley National Corridor. 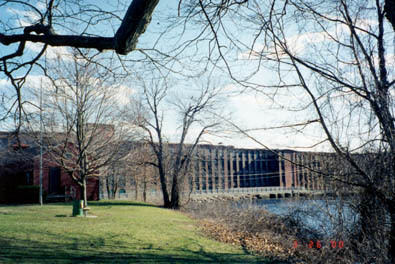 A mill on the Blackstone River in Woonsocket, RI. They are restoring it. 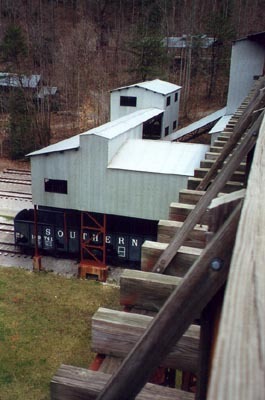 Part of the BVNHC. 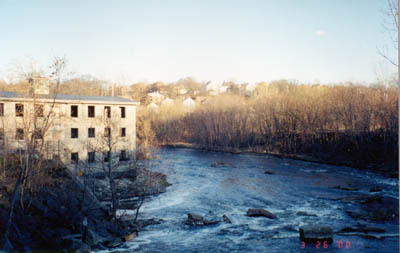 A mill on the Blackstone River in Woonsocket, RI. That's the river there. This is just down stream from a big dam. 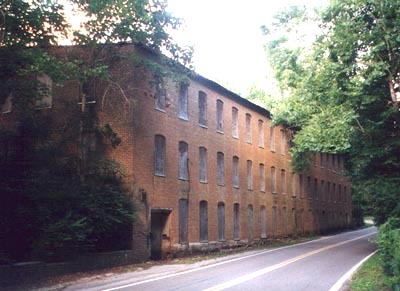 This mill complex is located in Forestdale (I think.) I like that bell tower quite a bit. BVNHC again. 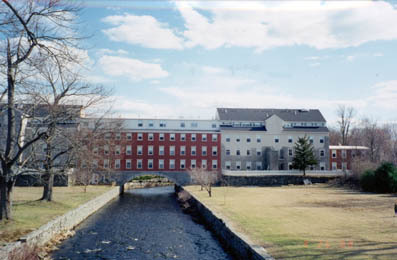 Staying in the BVNHC is this mill complex (Draper Manufacturing) in Hopedale. Just to the left is the Little Red Shop. These three images are of mill housing, some of my favorite items. 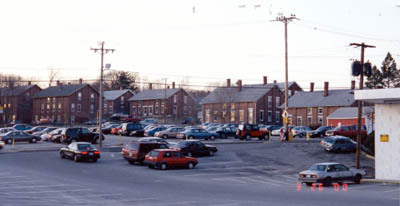 This one is Rogersons' Village in Uxbridge, MA. 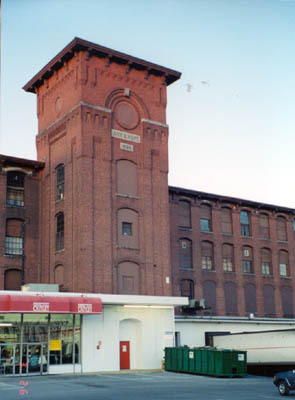 This mill complex is next to the Ann and Hope mill in Lonsdale. 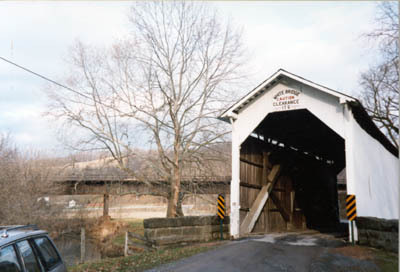 It is a really neat example that hasn't been restored much. 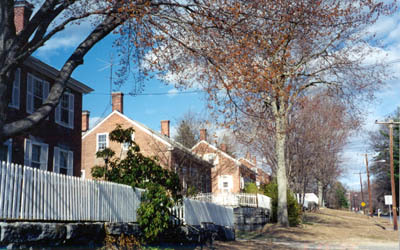 Ashton sits off of Route 122. Its down in a valley, so you have to go down a steep road, but the overview is cool enough. 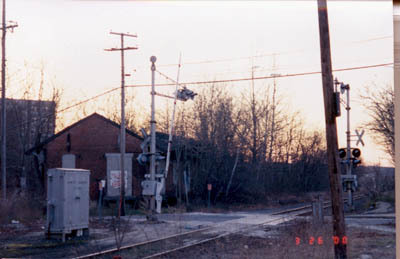 This train depot (the red hunk in the back) is in Lonsdale. I almost missed it on my way out of the Ann and Hope complex. Not specifically in the BVNHC, this crane is back behind the Johnson and Wales Culinary Museum. Its in Providence. 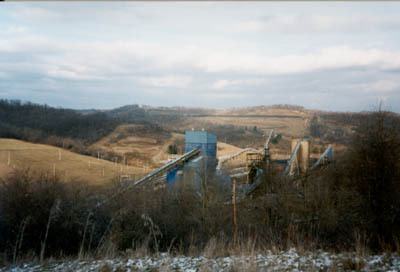 These Greene County, PA images are of a major coal mine in the southern part of the county. I love those tipples and coal transfers. My father works in a mine, and I guess I have grown to like them. 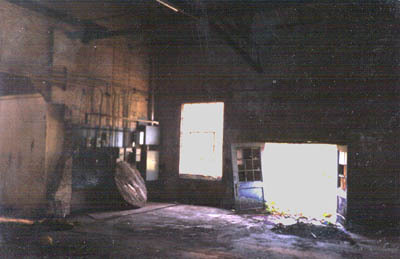 These images are of a "trip" I did to a closed mine. I wouldn't suggest it for everyone, but it was cool. 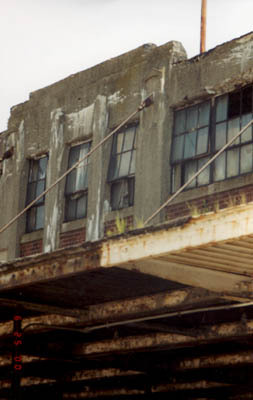 The first two images are of the old office building and machine shop. That was about the extent of the tour. There were several other buildings on the land, but this was the best concealed. 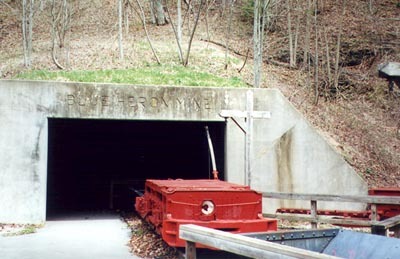 The actual mine entrance was still visible, and you could feel cold air from around the seal, but we didn't push the point to go closer. 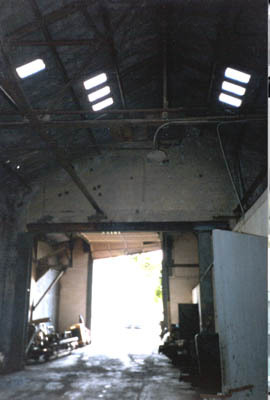 The picture on the right is where we entered into the machine shop. Nothing much here, but some cool old leftovers. These three rooms were pretty interesting. I especially enjoyed this old boiler on the right. You can't see much, but it goes on for quite a way. I haven't a clue what that next machine is, but I think you get the point as to what is in these rooms. I really enjoy this picture on the right. Something about it makes it perfect for preservation related images. Probably the piles of wood and the window. 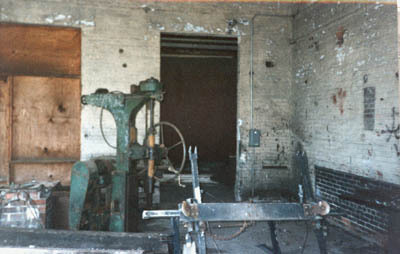 The image on the left is of the machine shop's main bay. It almost looks like they wheeled engines and cars into the bay. There were tracks, but they ended outside. So maybe it changed later on. 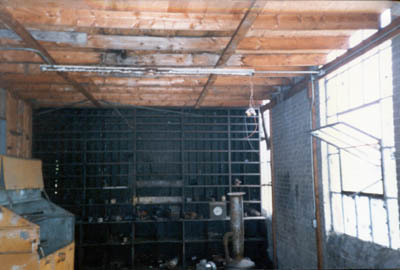 The room in the second image shows where they kept their tools for the machine shop. We found a set of engineering plans here. For god knows what, but cool none the less. The last image is in the office building. The white walls are of the bathroom. I like that truss above us. I can't remember exactly where this is, maybe in Bellows Falls, VT. 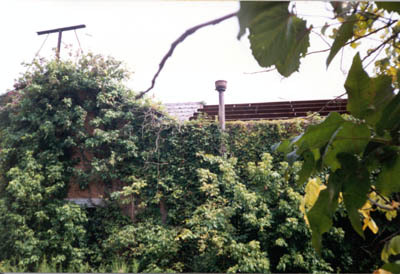 I enjoyed the building's rhythm and the color with the green ivy. 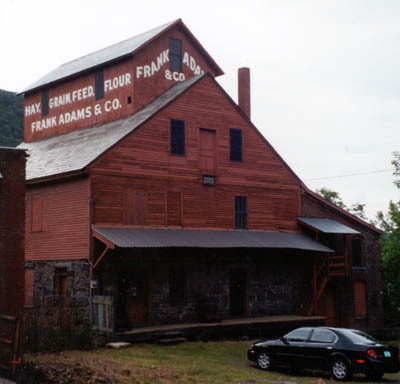 Frank Adams and Co. in Bellows Falls, VT. This is right next to the dam and power station. Both are worth a visit for IA. If you are lucky the folks from the Historical Society will be there to talk, like I was. Great folks. 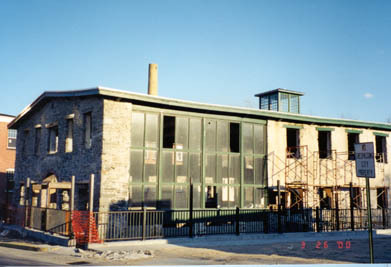 This mill complex is in Windsor, VT. I think it is a museum of industrial technology or something. 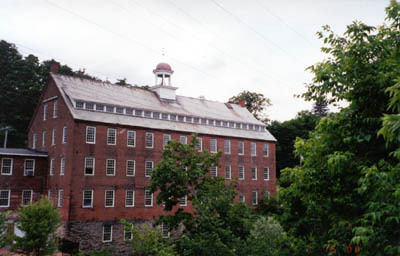 Its a good example of an early mill. 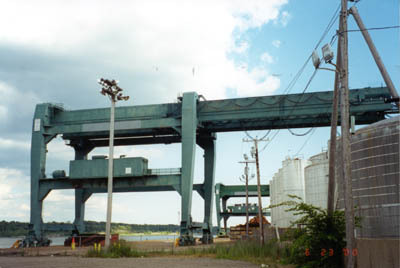 Here are three railroad related images. The one on the left is probably from Maine. 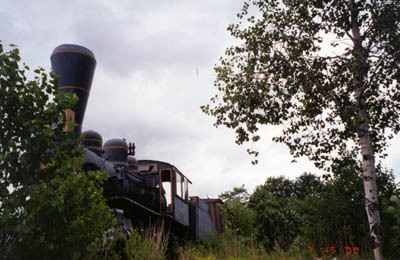 It was sort of a fluke to see this old engine parked along the road. Weird. 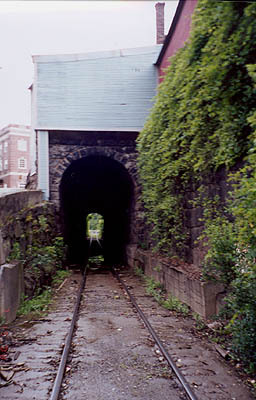 The second image is of the tunnel under the city of Bellows Falls. As you can see, its a small town! 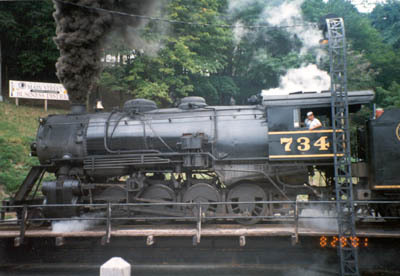 The last image is of the engine on the Western Maryland tourist railroad at the turntable. Lots of fun. Well worth the trip to Cumberland, MD. These images are from Providence. 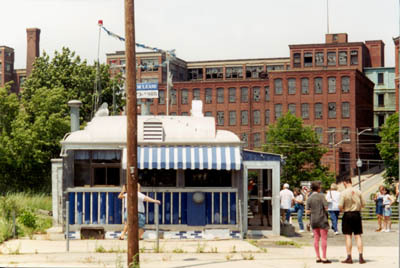 The first is of the Silvertop Diner with a big mill complex behind it. If I remember correctly, it is the Foundry complex. 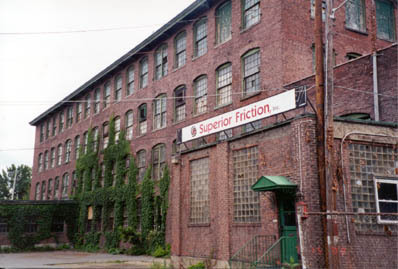 The second two are of the Tourtello and Company's warehouse. Both are slated to be torn down because of the new mall that is just down the street. I really enjoy the warehouse. 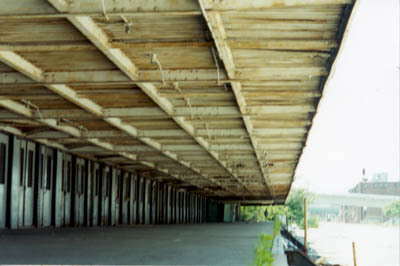 Isn't that loading dock just a work of art? Blue Heron Entrance. This is low coal, or it has coal seams less than four feet. 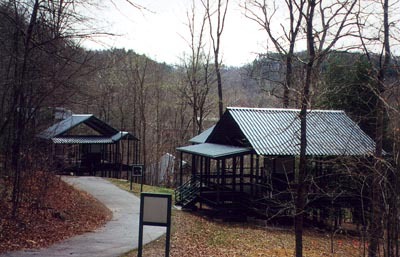 When Big Fork NP was established it took the land from Steans Coal Company. 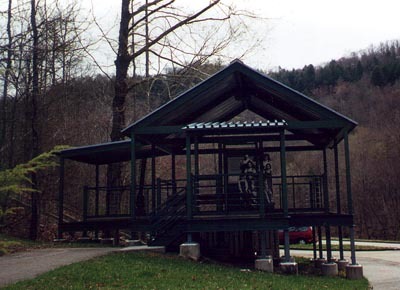 The NPS has reconstructed the tipple building for visitors. You can actually walk that bridge - which replicates the coal belt. I took this picture from the interpretive signage. 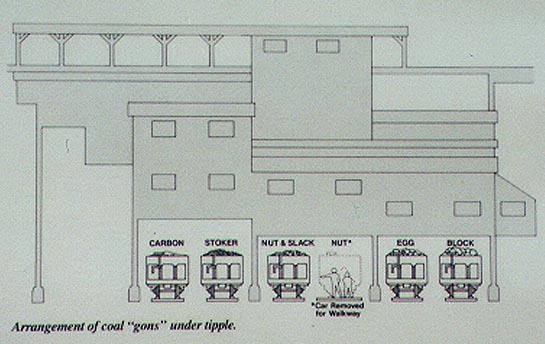 I like it because it really tells the story of which coal car corresponds to which chute. It helps us model railroaders figure out how to make things look right. 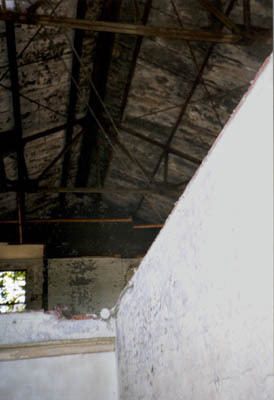 This is an intepretive version of a school building at the patch town. Instead of building new buildings to replicate the actual structures, they built these frames to give us an idea of the bulk and scale, not the real building. I wish the land was a bit more rural, but it has to be handicapped accessible. This is a view of the tipple from above. You can see how they constructed things to really give you a feel of how the buildings went together. There is still a shower building that is standing, but everything else was taken down. These are workes houses up on the hill above the tipple. Again, the method of interpretation versus replication was used. I really like this method, but many do not. Tasters Choice I suppose. 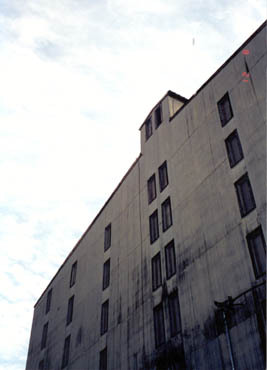 One of 20+ warehouses for the Jack Daniels Distillery in Lynchburg, TN. It smells pretty strong in here, but worth the visit. 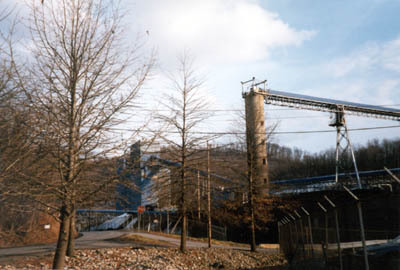 This is a textile mill near Rock Island, Tennessee. Its so very close to the edge of the road that it makes the situation a bit scary for driving. 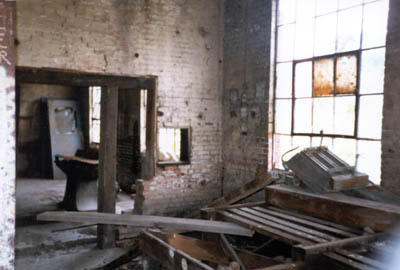 This whole area is littered with old mills. 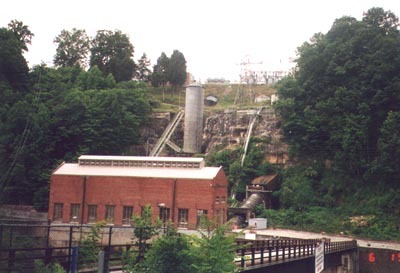 This is a Tennessee Valley Authority Dam at Rock Island, Tennessee. It was on the way to one of our first camping trips together in Tennessee. 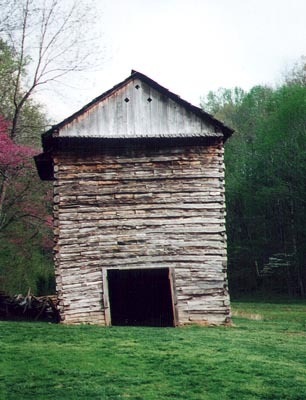 This is a tobacco barn on the grounds of "Land Between The Lakes" in northwestern Tennessee. The whole comples is a vernacular farm site. 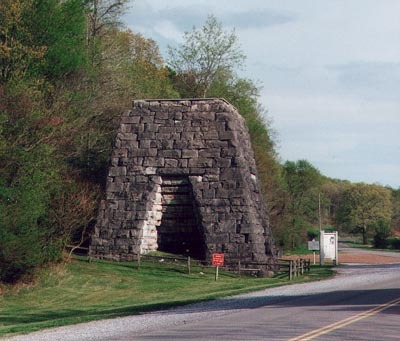 This is a coke furnace along the road into Land Between the Lakes. 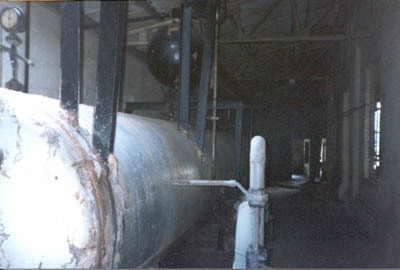 Its an early style furnace and there were several more along the site orignally.